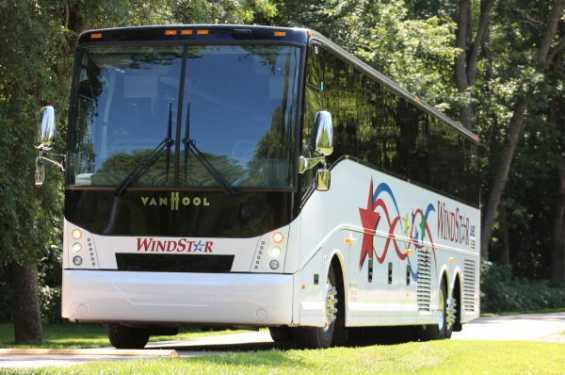 Windstar Lines is a family owned and operated charter bus company that has been in operation since 1995 and has earned a reputation in the industry for safety and customer service that the staff is very proud of. Windstar serves customers from 9 locations, including Carroll, Cedar Rapids, Des Moines, and Dubuque, IA, and Rockford, IL, Kansas City, MO, Lincoln, NE, Las Vegas, NV, and Sioux Falls, SD. The company has a large, varied fleet that can accommodate groups of any sizes, and drivers who are friendly, safety-conscious, and customer service-oriented at all times. Their customers include schools, churches, travel clubs, tour companies, military and government, entertainers and bands, corporations, convention and meeting planners, professional athletes, resorts & casinos and private individuals. For any and all of your charter bus needs, Windstar looks forward to serving you!